Environmental imperatives and safety requirements are two critical issues facing the automotive industry worldwide. Indian Automobile Industry in the last decade has made significant progress on the environmental front by adopting stringent emission standards, and is progressing towards technical alignment with international safety standards. Central Motor Vehicle Rules (CMVR) came into force in 1989 and serious enforcement of regulations came into effect. 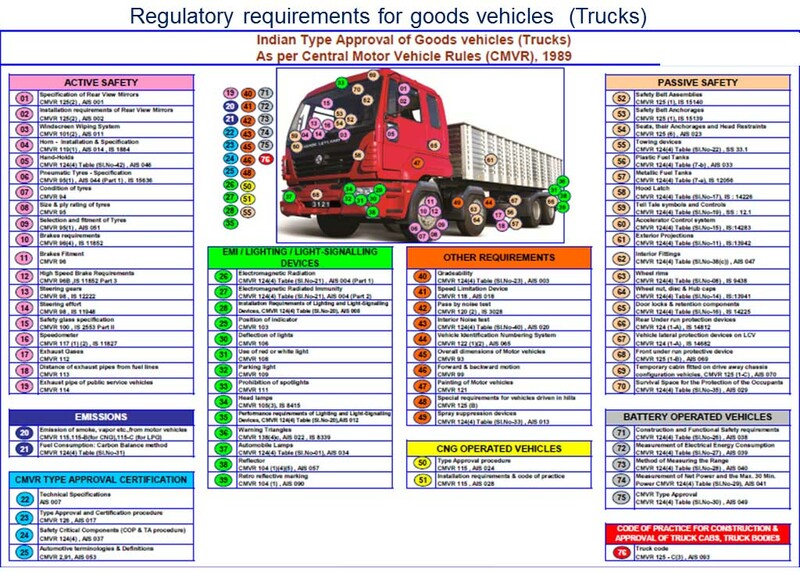 Chapter V of the Central Motor Vehicle Rules, 1989 deals with construction, equipment and maintenance of vehicles and in addition to rules governing vehicle emission limits, there are several rules in this chapter mandating compliance of safety regulations for motor vehicles. Vehicles manufactured in the country have to comply with relevant Indian Standards (IS) and Automotive Industry standards (AIS). 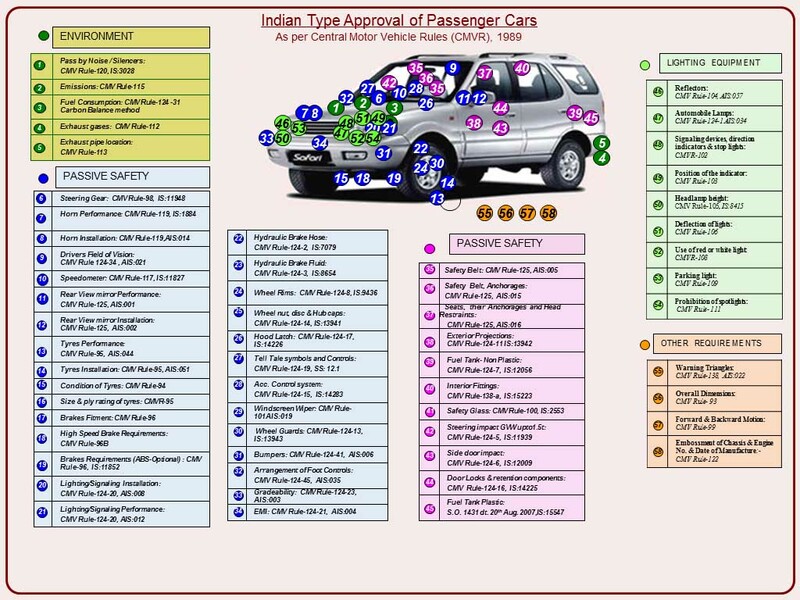 Indian Standards are being issued since the late 1960s and these standards for Automotive Components were based on EEC/ISO/DIN/BSAU/FMVSS, etc. at that time. India signed the UN WP 29 1998 Agreement in Feburary 2006. It continues to actively participate in the Global Technicla Regulation (GTR) formulation by contributing data and subject matter expertise. SIAM members chair the different expert groups formed to formulate India stance on the various safety regulations. This has helped in developement of GTRs taking into consideration the traffic and driving conditions in the developing countries. India has curently more than 70% safety regulations which are either partially or fully technically aligned with GTRs and UN Regulations while retaing Indian specific driving and environmental conditions. Regulations are reviewed periodically by AISC and amendments are recommended to the Technical standing Committee on CMVR for adoption and subsequent notification by MoRT&H under the CMVR. States also have their State Motor Vehicle Rules. 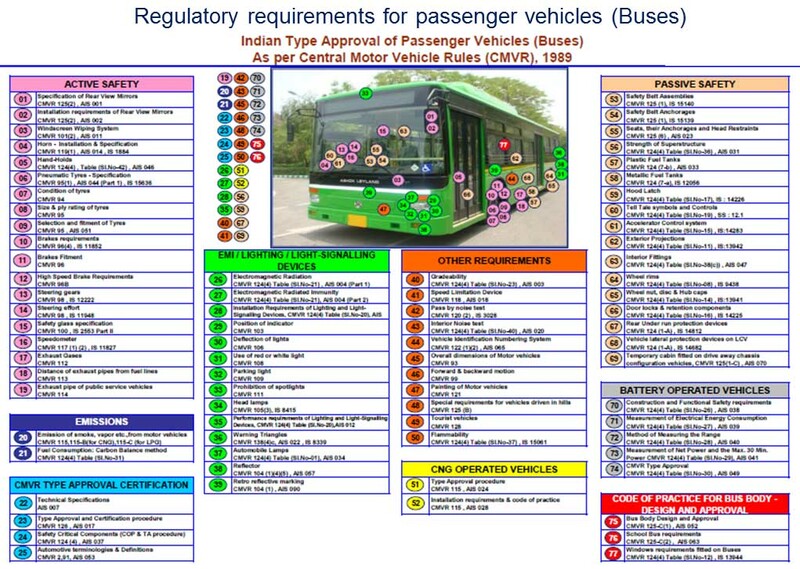 These rules are mostly related to seating arrangment for transport vehicles, etc. Since 2000, ECE Regulations have been referred to as basis for formulating Indian regulations and since 2003, increased efforts are being made to technically align with GTR / ECE. Variance from GTR / ECE exists on formatting, phraseology and administration related issues. Alignment of Indian regulations (AIS / BIS) with GTRs / ECE is being attempted as per the broad roadmap drafted by SIAM. In order to have a planned approach for the introduction of advanced safety features, SIAM drew a roadmap for Automobile Safety Standards. The roadmap was prepared by the CMVR, Safety & Regulations Committee. The current traffic conditions, driving habits, traffic density and road-user behaviour necessitate that maximum safety be built into the vehicles. Progressive tightening of safety standards taking into account unique India requirements has been addressed in the roadmap with a view to reduce the impact of accidents, thereby improving safety of the vehicle occupants and vulnerable road users. The roadmap was presented to the Government in January 2002 which received an in-principle approval of the Ministry of Road Transport & Highways. Based upon discussions with all stakeholders, a roadmap has been finalized by the Ministry and work has commenced on drafting standards and notifications for the various stages. The roadmap is reviewed from time to time to align with the changing environment and new regulations being formulated in UN WP 29. Safety critical components are covered under AIS-037 to bring about better control at the OEM and after market. The regulation also brings these components under Conformity of Production. Crash Requirements will be introduced in the country mandatorily 2017 onwards after the test facilities are commissioned in 2016.